Oh hi. Today we are getting crazy with spicy southern deviled eggs. These delicious deviled eggs are spiced up with hot sauce and chopped jalapeños. 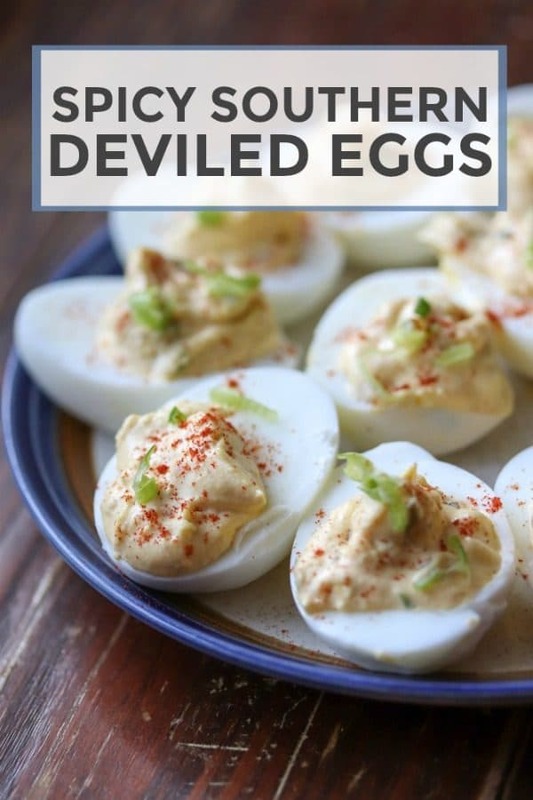 A sure treat for anyone who loves deviled eggs! Today is a special day because we are celebrating the arrival of Angie from Big Bear’s Wife’s baby by throwing her a surprise virtual baby shower! 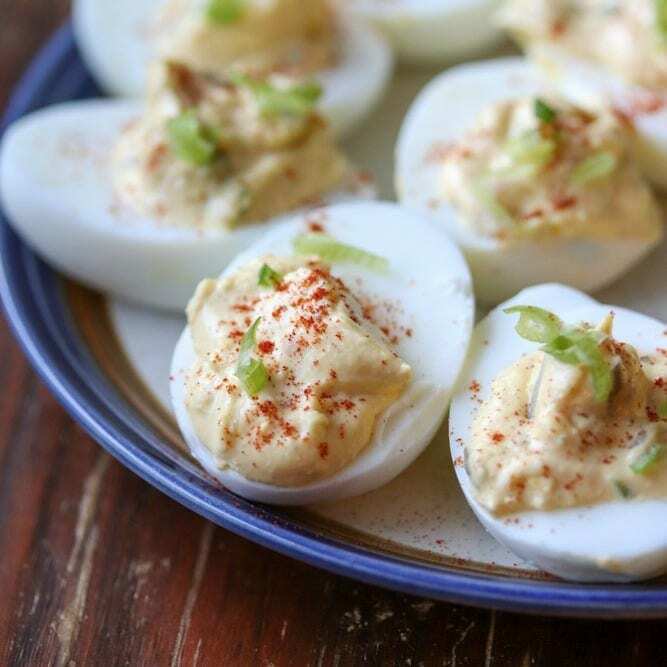 I know she loves southern food so I’m bringing these spicy southern deviled eggs to the party. 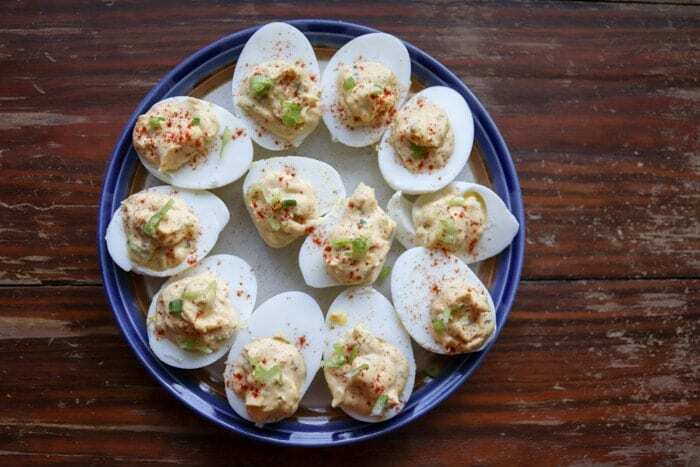 ♥︎ In addition to these deviled eggs, you’ll find other delicious recipes brought to the baby shower by fellow food bloggers at the end of this post. These deviled eggs are made with the ingredients used in traditional southern deviled eggs: mayo, mustard, relish and paprika. In addition to the traditional ingredients, I added chopped jalapeños and a dash of hot sauce to make these eggs spicy! They aren’t super spicy deviled eggs so you can enjoy them even if your palate typically doesn’t prefer spicy foods. WIN! These spicy southern deviled eggs are super easy to make and are full of bold flavor, thanks to the jalapeños, hot sauce and sweet and spicy relish. I used Wickles relish but if you can’t find that, sub with your favorite sweet relish. 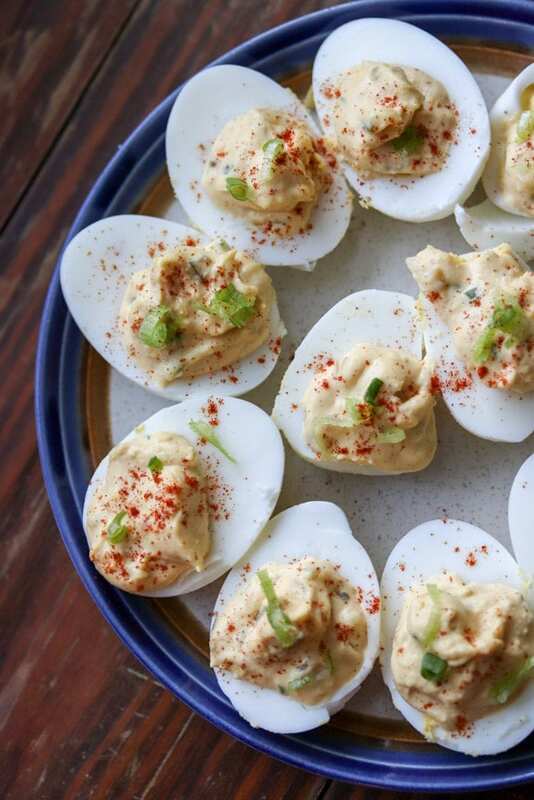 Serve these deviled eggs at parties, on game day or at baby showers! These delicious deviled eggs are spiced up with hot sauce and chopped jalapeños. A sure treat for anyone who loves deviled eggs! Hard boil the eggs, peel and allow to cool. Once the eggs are cool, slice in half lengthwise and place the yolks in a mixing bowl. Add the jalapeno, mayo, relish, mustard and hot sauce to the mixing bowl with the egg yolks. Mix well. Fill each egg with the egg yolk mixture. Be sure to distribute evenly (see notes). Garnish with sliced green onion and paprika. For filling the eggs: I filled up a ziplock bag with the egg yolk mixture, cut a small section out of a bottom corner of the bag and squeezed the mixture into each egg. I start conservatively and fill each egg with a small amount of the mixture and then add more to each egg until all are filled evenly and all of the mixture is used. Nutrition information calculated using My Fitness Pal and is an estimate. I love the spicy twist! Perfect for any occasion!!! I cannot wait to try these. My husband is a deviled egg lover and appreciates a bit of kick, so I just know he is going to go gaga for them! Now these are the PERFECT deviled eggs to bring to a party! Deviled eggs are one of my favorite things to have during the holidays and at parties! This post makes me want to make them right now! Deviled eggs are my fave! Thanks for joining this weeks Creative K Kids’ Tasty Tuesday. I look forward to seeing what you share next week! Love the addition of the jalapeños — must try! My husband’s mother makes deviled eggs, and I can’t get enough of them. I love your spicy twist on them, they look delicious! Thank you for sharing with us over at Fiesta Friday! I like deviled eggs but never remember to make them!…this recipe is a nice twist. I love anything egg and these look amazing! Thanks for sharing and happy Fiesta Friday! What a fun shower for Angie and Big Bear, Congratulations to them! Your deviled eggs look delicious! Thanks so much for sharing your awesome post with us at Full Plate Thursday and come back soon!